It wasn't just the same venue; the manner in which the second ODI transpired was strikingly similar to the one that panned out on Friday. Deciding to bat first after winning the toss, Pakistan anchored their innings around a hundred from a top order player - this time it was Mohammad Rizwan - and posted 284, four more than the palpably inadequate 280 they had managed in the first ODI. Once more, Australia demonstrated this to be woefully short of what might have challenged them, an unbeaten career-best 153 from Aaron Finch and an opening stand of 209 with Usman Khawaja allowing them to canter to their second consecutive eight-wicket win. The only deviation from the first game was the chase contained even less drama than in the first ODI. Whereas Khawaja had fallen relatively cheaply then, the opening partnership this time was colossal in the face of another uninspired bowling effort from Pakistan. Finch and Khawaja amassed 209 and rarely did Pakistan threaten to break through; the ball spun very little for Yasir Shah and Imad Wasim and swung even less for the quicker bowlers. 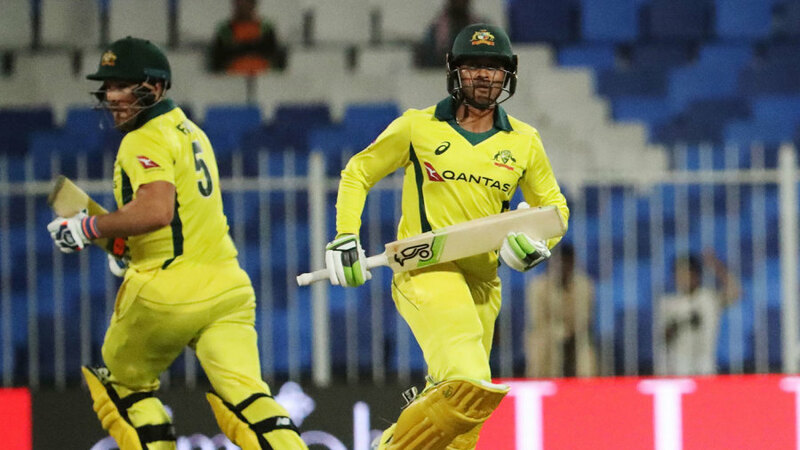 While Khawaja was the more prolific partner during the Powerplay, Finch came to life from the moment he lofted Yasir for six off the first ball of the sixteenth over. Till then, he had 28 off 43 balls but, as if the effect of a sedative had been neutralised by one stroke, he sprang to life. He completed his half-century just 14 balls later, and bludgeoned Yasir for two sixes and a four in the over that followed, and a further six and four off Imad right after. That put any qualms about the run rate to bed, and the chase was every bit a canter as the first match after that. Khawaja continued to cash in on his fine form, reaching his fifth half-century in seven innings off 60 deliveries. After a strong start he was content playing the steady hand and appeared to be cruising to a hundred until he holed out to deep midwicket 12 runs short. It gave Glenn Maxwell the opportunity to free his arms in an entertaining little cameo, two sixes off Imad quelling any fears of a Pakistan comeback, but he missed the chance to finish the game when he was run out. One of the key points of fascination for Pakistan enthusiasts this game was the performance of teenage quick Mohammad Hasnain, drafted in for his first List A game following a stellar PSL. His introduction was one of the only times a sparse Sharjah crowd came to life, and the cheer after his first ball - a bouncer which forced Khawaja to hastily duck - was louder than perhaps at any point all day. That aside, however, it was a tough initiation for the 18-year old. His pace might have been up, but he lacked the control and consistency that will surely follow as he accumulates experience, and when Finch swatted him for six over cow corner in the 47th over, the game was for all intents and purposes done. For good measure, however, the Australian captain thwacked Faheem Ashraf for another one the following over, bringing up his 150 in 141 balls, and finishing off the game in the same over. Pakistan's innings had been paced at the same leisurely rate as in the first game. Australia's bright start put them on the back foot straightaway, thanks to a brilliant opening spell from Jhye Richardson who cleaned up Imam-ul-Haq for a duck in the first over. Maintaining a probing good line, he gave the batsmen little room for error as Pakistan started sluggishly. Even as the boundaries flowed from the other end, with Haris Sohail timing the ball exquisitely, Richardson gave away few runs, and also brought about Shan Masood's downfall with one pitched slightly short of a length that was chipped to midwicket. His day turned sour, however, when he suffered a dislocated shoulder in the outfield. Diving to save a boundary at midwicket, he landed heavily on his elbow, and his reaction immediately indicated he was done for the game, and very possibly the series. The silver lining for Australia was Finch, who brought himself on to fill the gap Richardson's overs left behind and was among the pick of Australia's bowlers. He started off by removing last game's centurion Haris Sohail for 34, a slight tickle to the keeper giving Finch just his third ODI wicket. So bothersome did he prove for Pakistan he ended up bowling his full quota, and, until his final over went for 12 to bring his overall tally to 41, Pakistan never looked to attack him. Pakistan found themselves in deeper trouble when Umar Akmal holed out when he lofted one slightly short by Nathan Lyon to the square-leg boundary fielder. He had gone for 16, his reaction of desperate disappointment fitting for a man given an unlikely opportunity with little room for error just ahead of a World Cup. But Rizwan and Shoaib Malik got together with Pakistan in strife and kept Australia at bay for nearly half the innings, putting on 127. Rizwan was excellent at working the gaps and using his feet to the spinners, while Malik has been in these situations with Pakistan often over a two-decade career, but his record against Australia isn't the best. The half-century he brought up off 53 balls was just the second against Australia, and it was one of hard graft rather than cavalier flamboyance. Rizwan is in the side as Sarfaraz Ahmed rests, but looked determined to make the case for World Cup inclusion, even for his batting alone. Promoted to No. 4, he had performed the role many specialists in Pakistan had failed to perform in that position, and when he swept Adam Zampa to bring up a first ODI hundred, Pakistan were ready to launch once more. They never quite got around to doing that, with the pair falling in quick succession and they ended short of 300 again. That wasn't just well short of 300, but also well short of anything that would have made Australia sweat. But then again, the way Finch batted, one wonders if anything would have proved out of the visitors' grasp.